Lectoure’s Blue has just been awarded the Eco-défi challenge label thanks to its innovations in pigment extraction, ecological dyeing, as well as its organic pastel culture. Eco-défi is a free operation orchestrated by the Regional Chamber of Trades and Crafts in the heart of the territories. This label rewards the implementation by merchants and artisans of precise and measurable actions to limit the impact of their activity on the environment. 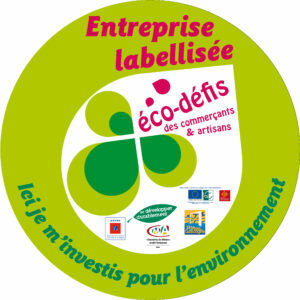 Waste management, energy saving, reduction of water waste, adoption of a more flexible driving, use of techniques and non-aggressive products … so many challenges (at least 3 with the support of advisors of the CMA) to obtain the label “Eco-défi” awarded by a “labeling” jury. Eco-défi prove the adaptability of traders and craftsmen to the requirements of sustainable development and also shows that they know how to meet the expectations of consumers: “90% of respondents say they are ready to favor a trader or a craftsman who puts in place practices that respect the environment. ” Source CCIP Val de Marne.